No. 23 Maryland overcame a sluggish start to beat Loyola of Chicago 55-41 on Saturday. See photos. BALTIMORE (AP) — No. 23 Maryland used its defense to work its way out of a tough spot. Anthony Cowan had 17 points and Maryland scored 20 points off turnovers in a 55-41 victory over Loyola of Chicago on Saturday. The Terrapins also held the Ramblers to 32.7 percent shooting while bouncing back from Thursday night’s disappointing 62-60 loss at Purdue. Cowan and Fernando scored on Maryland’s first two possessions of the second half, and Cowan added a 3-pointer to make it 31-22 with 17:03 to go. Loyola never got closer than six points the rest of the way. 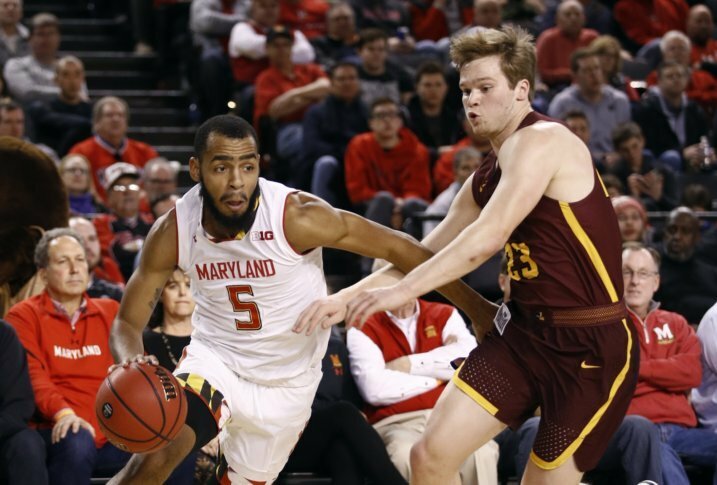 After scoring a combined two points in the Terps’ last three games, freshman reserve Serrel Smith Jr. had eight points, all in the second half. “Serrel probably had his first- or second-best game of the year,” Turgeon said. Loyola of Chicago enters a week-long exam break and won’t play until Dec. 16, when it entertains Norfolk State. Maryland hosts Loyola (Md.) on Tuesday in the teams’ first meeting since 2003.